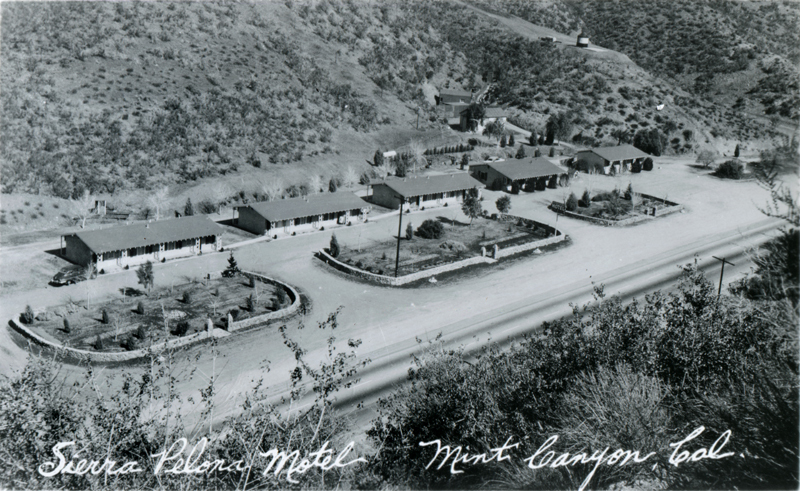 Sierra Pelona Motel in Mint Canyon. The modern address is 12117 Sierra Highway. Unused, uncredited real photo postcard, 1950s. According to L.A. County Assessor records, the first of five buildings, at 1,188 square feet, was built in 1950. The second and largest, at 2,964 square feet, was added in 1953. The other three (437, 668 and 1,088 square feet) were built in 1954. In the early 2000s the motel was owned by Juan Alonso, who also owned the nearby Le Chêne French Cuisine restaurant and cultivated wine grapes on the surrounding property. LW2639: 19200 dpi jpeg from RPPC purchased 2014 by Leon Worden.